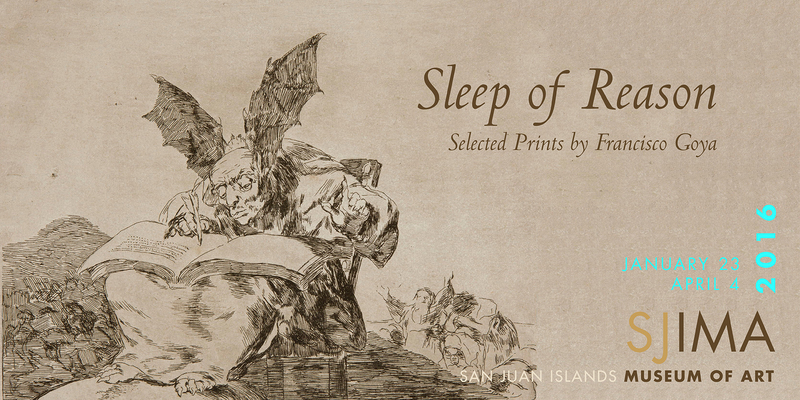 FRIDAY HARBOR, WA—The San Juan Islands Museum of Art (SJIMA) presents Sleep of Reason: Selected Prints by Francisco Goya. The exhibition presents 16 prints culled from two of Goya’s famous suites of prints: Los Desastres de la Guerra (1810–20) and Los Caprichos (1797–98). The prints of Los Desastres were so politically charged they couldn’t be published in his lifetime, and were only released posthumously several decades after his death. Famous for both impeccable technique and unwavering commentary of war and corruption of the human condition, these prints articulate his despair and endure in the universal acuity of this vision. These prints were generously loaned to SJIMA from the Collection of Tom and Lori Firman. Goya served as a court painter for four successive rulers of Spain and is considered one of the most imaginative Spanish artists. An extraordinarily incisive observer of the human condition, his work explores diverse subjects, genres, and formats. SJIMA’s exhibition focuses on his prints, a genre in which Goya explored expressions of human society and human nature as it is shaped during war, famine, and intense poverty. He did not shy away from difficult subjects, and his prints confront hubris, ignorance, superstition, and myriad forms of violence. The title print of the exhibition The Sleep of Reason Produces Monsters depicts Goya himself slumped over a table haunted by nightmares and demons swirling about him in the form of owls. This exhibition is provided as an historical counterpoint to the exhibitions by contemporary artists Ai Weiwei and Dana Lynn Louis, also on display in the museum. Together, all three exhibitions are linked by the common thread of human rights. Sleep of Reason: Selected Prints by Francisco Goya was curated by Ian Boyden, Executive Director of the San Juan Islands Museum of Art. With degrees in the History of Art from Wesleyan University and Yale University, Boyden’s exhibitions explore diverse subjects such as contemporary artists of the Northwest, Chinese calligraphy and scholars stones, and climate change. His work demonstrates ecological awareness, place-based thought, East Asian aesthetics, and intense interest in material relevance. For the past twenty years, Boyden has shared his time between the Northwest and China. As the Artist/Scholar-in-Residence at Suzhou University in 2011–12, he conducted research on Chinese inks and had a solo exhibition of paintings, books, and video installation at the contemporary wing of the I.M. Pei-designed Suzhou Museum in China. SJIMA is one of the newest visual art museums in the Pacific Northwest, officially opening the doors of its new facility in 2015. SJIMA champions artists, the arts, and arts programming because it champions authenticity of expression, place, and connections. Through its exhibitions, education, programs, and events, SJIMA establishes the San Juan Islands as a place of legacy making—legacies of art-inspired transformations, of expansion and wonder, and of support for our artists and arts communities. Publicity images for Sleep of Reason: Selected Prints by Francisco Goya are available by request.